This tutorial is a quick fix for HP laptops that wireless does not work on Ubuntu 18.04 Gnome desktop. On my cheap laptop HP 246 G6 I found that the wireless network does not work out-of-box after installed Ubuntu 18.04. No wifi option in system tray menu, and System Settings says ‘No Wifi adapter found‘. This happens on many HP devices including HP 15-bs000, 15-bs100, 15g-br000, 15q-bu000, and Pavilion 15-br000, HP 280 G3, 290 G1, and more. And the reason is Ubuntu does not support RTL8723de wifi driver. See the UPDATED tutorial installs the drivers with DKMS support, since Wifi may not work after installed or upgraded to a new Linux Kernel (after reboot). 1. Reboot and go to BIOS to make sure wireless network are enabled. And plug laptop into a wired connection. 2. 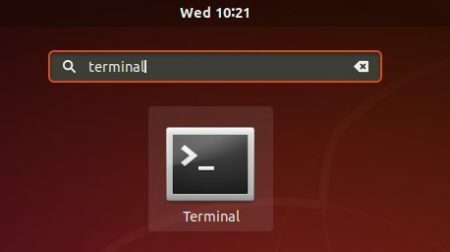 Open terminal either via Ctrl+Alt+T shortcut key or by searching for ‘terminal’ from software launcher. (REQUIRED) Or write the rule into configuration. REPLACE X with whatever setting (1, 2, or 3) worked best. You missed one step. Plug laptop into a wired connection. And is your problem solved . Because I aslo want to install Ubuntu 18.04 in it after buying. Hi, I recently bought 15da0077tx and installed ubuntu 18.10 but faced the same problem of no wifi adapters. I followed the steps exactly as described here and now wifi is working good. So you may go ahead with the purchase and install ubuntu. Congratulations!!!! your solution works very well. Trying to resolve the issue from past 2 days. Today I set it right with your help. Dear Jim, I followed the procedure as you described, but I got stuck at point Nr. 4: Terminal does not accept the command sudo make install. HI Ji M, I have just purchased a HP 15da0 laptop and installed Ubuntu 18.04 LTS with the problem wifi adapter not found. I followed your procedure and all is now working. I finally found the problem. Since the old driver had a lot of problems with the wifi connection stability I added a custom config file which disabled the powersaving mode. This option seems to be no longer valid for the new driver and stopped the new driver from loading. make: *** /lib/modules/4.15.0-33-generic/build: No such file or directory. Thank you so much for putting this explanation together. Worked perfectly. I am using a laptop Hp amd e1 crr model rtl8188ee and i am facing that issue of wifi adapter not found from the last week since i installed ubuntu 18.04 i tried my level best to resolve the issue but not succeed kindly help me if you can. Thank you! Wow it works like a charm on my hp laptop elementary os loki version… Only u need to disable ethernet network from settings that’s it!!! modprobe: FATAL: module rtl8723de not found. Check the source directory (rtlwifi_new) in your file browser and see if rtl8723de folder exist. Cannot use config stack validation=y, please install libelef-dev, libelef-devel or elfutils-libelef-devel. Kernel doesn’t support pic mode. After step 5 i get this :modprobe: ERROR: could not insert ‘rtl8723de’: Operation not permitted. I’m not sure what to do next after this step would you help? For me this was because Secure Boot was enabled in the BIOS. I went into the BIOS and Disabled it. Worked for me after that. I think you can re-enable secure boot after configuration, but haven’t tried it yet. please help me to come out from this . Hi Munish Battu. Are you following this tutorial for the 1st time or you’ve already done it before, and now trying to fix your adapter again? I followed this tutorial some time ago and it worked for me. Unfortunately when my system installed updates, my adapter got removed again. So I came back to this tutorial to fix it again, and got the error at the same stage as you did: ‘ sudo modprobe rtl8723de’ returned ‘exec format error’. I tried to reboot few times but it did not work. So I went to Downloads folder on my laptop and removed the ‘rtlwifi_new’ folder completely(if you already worked througth this tutorial you will find that folder there, but if you don’t have it there I’m afraid this solution will not help you). And then I started over again from steps 3.1 onward. And it worked smoothly. Try reboot your machine. If you still get the error, see the bug. Stuck here . Can someone pls help . This is the best process. and thank you for help and its working. Oh my goodness, this worked! Thank you! for me setting ant_sel=2 did the trick after installing the package. I saw the WiFi networks, but couldn’t connect. I had to disable the PCIe power savings. This helped me “https://askubuntu.com/a/1041830/882226”. Now everything is working fine. Here’s a fun question for you, what do you do if your ethernet connection is broken because someone stuck a usb into it not realizing it was the wrong port and broke the pins inside? Hi Tyler, I had the same error on a dual boot with Win10. I had to run the grub fix tool found in the ubuntu forum and run the most likely fix. (This after changing EFI to unsecure boot). Can’t tell you, why, but afterwards I used cd to move to the right directory and did the two sudo modprobe steps. Took a while to take affect and I had to turn WIFI on in the settings menu. But it works. can you explain in detail what you did to solve this problem, please? Did you try the last command in the tutorial? The tutorial is very helpful but the last section is confusing: it really really looks like a section for people still having problem after the modprobe, you never state that the last command is for everyone. My guess is that you also have to skip ant_sel if you didn’t need it in the first place… It would be nice imho to make a step 7 to explain how to load the module each time you start the machine automatically. Ok, after a few tryouts, I found out that the module is loaded for me at boot when I add it to: /etc/modules ! I did everything like on instructions. I had week signal and used second command given there, and it worked well. But when I tried last command my Wi-Fi has lost. Now, nothing is helping to find it back. git is not available for it. After running your instructions, I can connect to wifi only within very short range. How do get more extended range. Hi, ı tried Every step and these steps helped me first but then ı turned off my computer and when ı turned it on it was all the same, the wifi again started to say wifi adapter can not be found. I tried all steps again but this time they didnt work. So what should ı do? Please help me, ı am so desperate. Make sure the kernel module is installed, run command lspci -k. And disable secure boot if possible. Did you disable Secure Boot in UEFI (BIOS) settings and enable legacy? I’m glad this worked for you! For anyone else facing weak and inconsistent wifi connections, try running this script after changing rtl8723be to your adaptor name everywhere. i did everything you said but i`m stacked “sudo modprobe -r rtl8723de” and “sudo modprobe -r rtl8723de” everytime i try to use them ! nothing happens !! :( please help …. your commands working very good, but i have an issue, if i power off and power on the wifi run away again. If want to find it , i restart the same procedure, i want your help for fixing for ever. My computer is HP-Laptop-15 and the operating system is Ubuntu 18.04.1 LTS. It’s much easier if you select Software and Updates. Then Additional Drivers. Wait 1 minute for it to update then select the unused wifi adapter and wait whilst the driver is loaded. Total time about 3 minutes. Ok. Sounds like a plan, BUT where do I get the driver from? I have NO connection with internet after upgrading from 16.04 LTS to 18.04 LTS (Beaver) on my Acer! Doesn’t actually show anything… Should it come up automatically ?? I have tried several solutions but your comment is solved my problem with HP laptops WiFi on Ubuntu OS. Thanks so much Jim, I’ve been pulling my hair out over this for the best part of the whole day. Seems like this is a bit of a problem on HP computers. Also, every time you update your kernel you have to reinstall the wifi drivers. It worked. Great man!! Thanks. Can i get you to write me a script that walks you through and executes the lines needed? I follow your all step all have been success but I dont get wifi connection. Wifi device not found is already on setting. how do I do it. please for my bad english. I’ve got the same problem. Did you find how to fix it? It works after doing it.but once reboot again the same problem occurs. This helped me a lot and was the final solution after 2 hours of struggle…. thank you. Did you try the commands in ‘In addition’ section? please mine issue is that i actually see the WiFi tray upon installation but the strength of the WiFi is very weak even if am within the area where the network is provided. Is very weak please is there any means of rectifying this. Wonderful, in theory. Not sure how to put it into practice. Just got the new HP laptop. As far as I have ascertained, by looking at it, there is no way to make a wired connection. That’s a bit of a bother. I’ll find the paperwork and see if there is something I missed. Thanks for the information, either way. Successfully installed rtlwifi_new but it still not working. I issue is different, I was facing the issue “NO WIFI adapter found”, I have just followed your provided steps and finally got the wifi option and then I have used it easily. but when I restart my system then again I am facing the same issue.even I had trying the follow the same steps but I got the error message “already exists” then i have removed the “rtlwifi_new” manually and again follow your steps but not working at all. CAn you give me a suggestion or I need to format the system and re install the UBUNTU ?? the process works very well and eventually my wifi ends up working. But after sometime I had to update the system software and after restarting my laptop the Wifi disappeared. So now Am left to do your process again every time I install a package or update the system and its kind of tiresome. Is their a solution to fix that problem once and for all? Yep. I tried echoing. Now what happens is that it works well for a few days, maybe weeks, then one fine day when I start my machine, it goes away, and I have to run all the steps again. I think if you update your machine then it stops working but I’m not entirely sure. There’s some bug definitely. Would be great if you could fix it. How find which wifi adapter this laptop is having and how to install the drivers? Still showing “wifi adapter not found”, Although I successfully installed rtlwifi. It worked fine BUT when I restart the system the WiFi stops working. Any help? Thank you, it was working. My initial problem was weak signal but i still followed your steps 3 to 5, i checked my wireless connection and signal was srtrong. However i got greedy, i saw what Jerome suggested for weak signal issues and ran them too resulting back to poor signal. Ran steps 3 to 5 again, didn’t do it. I followed the instructions and the wifi starts working but does not connect unless I sit less than 50 cm from the router. I changed the antenna but nothing changes in the signal. Moreover, if I install dkms I cannot connect even with a wired connection. Finally, every time I reboot the laptop, I have to start over again. Is there any solution? – is it because it’s the wrong module? How do I make sure, it’s the right one? you need to configure this module to be automatically loaded after reboot. on a line by itself. Reboot. It should work now. I’ve got news – if you get “Required key not available” – then disable secure boot in UEFI (“bios”). I tried each and every command in this tutorial and first of all I got errors but now everything worked without error but still my WiFi doesn’t work. It still shows no WiFi adapter found. I have done the same and the problem resolved. But next day when I reopen my Ubuntu, the problem is back again. Hi ! It works in my case but every time I startup again,the problem repeats itself and this solution doesn’t work.Is there a solution for this? It worked the first around for me, but I didn’t get that the last command was for everybody (i.e. also the people without signal problems). So I restarted, of course I got nothing again. please guide me to fix it; I installed ubuntu 18.04 but I can’t connect my computer to password protected wifi. You have to install git before trying step 3.1. To do that use command the terminal told you to use, which is: sudo apt install git. And only then proceed to step 3.1.
hello, can I download codec from this side https://github.com/lwfinger/rtlwifi_new.git on my old laptop and then by pendrive get it to my computer with ubuntu 18.04? 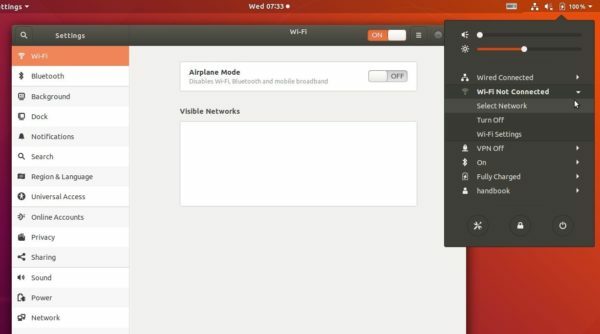 I don’t have possiblity to plug computer with ubuntu into a wired connection. Thanks for help. Mine laptop is HP-Pavilion-15-Notebook , intel 3 processor. Hello, I can’t plug laptop into a wired connection so can I just download codec from site and then transfer by pendrive to my computer with ubuntu 18.04? Thanks for help. Hy Ji M, Thanks for your solution it works very well. it also works for RTL8111/8168/8411 this drive too..
WOW man, you are genius. thank you so much. No man when on my first try, it got successfully worked after the next restart it goes back to same issue… Can you hve any solution? 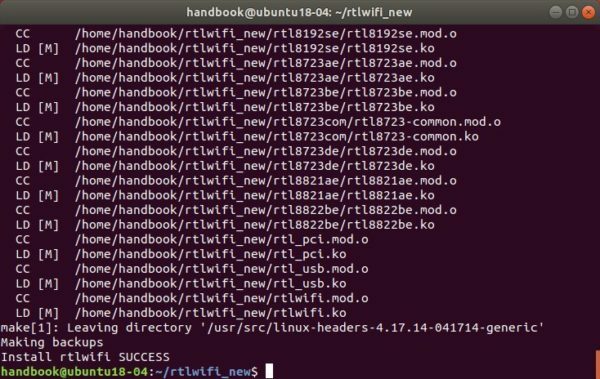 ubuntu 18.10 – HP-Laptop-15-bw0xx – RTL8723DE Device d723. My HP model is 14-ce0501sa. All steps successful and no errors. Rebooted etc. Still no Wifi Adapter. However my adapter gets disabled once every 5-6 days and I have to again follow this guide by cloning from git. Any idea why this happens? The mentioned method worked perfectly for Ubuntu 18.04 (when applied on 30/01/19) but the WiFi driver installed this way got automatically removed when system update was applied (for the month of February). Now, while trying to use this method, “exec error” is shown when following command is entered, “sudo modprobe rtl8723de”. Please do reply or provide a fix at the earliest. Also, when used with “Linux Mint”, the WiFi driver starts working, but is unable to connect to any network. And at last, would highly appreciate if you could provide a similar fix for “Manjaro” edition of Linux. The method is working fine. Got error because while repeating the steps, “make” needs to be cleaned. Thanks a lot for the detailed steps, it worked for me ! This solution perfectly worked for me . I have a HP laptop 14QCS009 . Thanks you so much . you are my hero, thank you so much after 7 hour’s trying to find the wi-fi I stumbled on this post followed your directions & it worked like charm. The problem with HP and Ubuntu is during installation. When you are installing, you need to check third party software and also enter password twice for enable secure boot. When the installation is successfully completed, you should see a message remove pendrive or cd and then press enter. Until then don’t remove the disk or pendrive. Then when you restart, you will see MOK blue screen, There you have to enter the password you previously gave during setup. To enter password, don’t go to Continue Boot, select the other option enter MOK and then set it up until it asks you for password and if you go for Continue boot you won’t see the screen again. And Please backup all data before doing any kind of setup. There are lot of disk realted things that can easily go away even with proper setup. You saved me man, Thanks a lot! This even worked for my Ubuntu 16.04. Don’t have broadcom drivers to remove according to terminal. thankyou so much bro.every step in this worked well and i searched in many sites for wifi weak strength but you cleared it in on step. Hi, Jim. I’d like to thank you for posting this solution. It worked for me! I am so happy, been trying to fix this for a few days with no luck. I have Ubuntu 18.4 on HP 15-bw. As one of the comments suggested I installed git first, and went through your steps from 3.1 and onward. I had an error at modprobe stage. But step 6 and restarting device fixed it. All your instructions were pretty clear and you helped a lot of people. Thank you a million! I got my wifi working. But after restarting the laptop It again goes on. Even my laptop getting good wifi signal also. I bought the HP Laptop 17-ca0023nb laptop. I tried the solution described here. thank you it worked well. but when turned on my system the next day it again shows no wi-fi adapter found.i tried doing executing the commands once again but i stucked at this point. Hi. I had the same problem at the same very stage. I think when you switched off your laptop it installed system updates that removed your adapter. I suggest you go to your Downloads folder and manually remove the ‘rtlwifi_new’ folder completely. After, go through entire solution all over again from the steps 3.1. It worked for me. Since then, my laptop got updates twice, and fortunately adapter remained working. Hello Jim, thanks for the information. Are you able to offer any suggestions? Thanks. Thanks a lot. I was stuck with this issue for over a week. By luck I came across your post. It worked. Had error after modprobe command but by disabling secure boot, things became smooth. what if this problem appear again after restart the pc? Thank you for the solution! It works perfectly! you are awesome it worked. This is a really good guide thank you, it worked wonders for me (I am running latest mint). I do want to mention one particular thing, I am unable to “see” my 5Ghz only my 2.4Ghz, despite the card in my machine being dual band. Could anyone please provide me with a little help on what should I do, I am confident is driver based issued. The only solution for Ubuntu 18.10 and even Ubuntu 19.04.